First lets take sealpoint, seal coloring is very dark blackish brown, the body of the seal colored cat will be fawn or tan or light brown, the color points on the feet tail and face will be blackish brown. 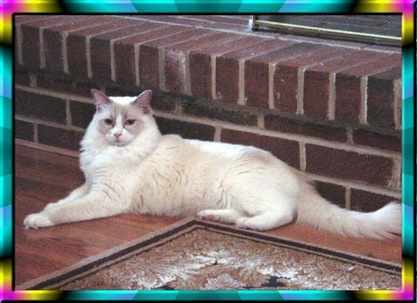 On a chocolate point the body is white or very light beige or off white, the point color will be tan/pink or pink/brown color. It takes days later to develop on a new born kitten when the color is chocolate or lilac but on a seal or blue, coloring comes in about 4-5 days old, the dilute colors can take up to 14 days to develop even the slightest color and when they come in they are very light never seal or blue. On a lilac the color of the body should be white or a pink/slivery white and point color is like the above cat. Many breeders are going around saying there cats are lilac but the above cat is a true lilac, the color will never be blue. The girl shown here is a mink lilac which is darker gray/ pink sometimes these look light blue on a mink and they are harder to identify but always has a hint of pink/gray. Sometimes a cat will look lilac or chocolate, these are usually just light seals and light blues, the difference is a blue will be a grayish blue a lilac will be pinkish gray and very light. 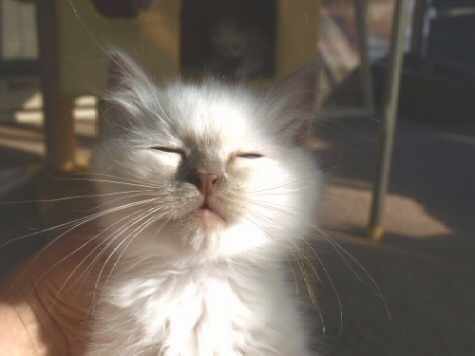 Once in a while we see a seal or a blue with an all white body, this is not a lilac or a chocolate unless both parents carry it and if the kittens coloring else where is extremely light, these dilute colored cats will have a special look to them, there nose color will have a rosy light color to it, mixed with point color lilac or rosy nose color with chocolate. Tail of a blue notice the tail here is gray not pinkish tinted? Two blue cats cannot produce a lilac unless both carry it, such as a parent on both sides or a grandparent, if both parents carry it then the kitten would be a lilac or chocolate carrier only and will need to be bred to another carrier or lilac/chocolate. Sometimes if two parents carry lilac this does not mean the kitten is a carrier and will need to be DNA tested and most likely if one parent is carrier this lessens the kittens chances even more to being a dilute color carrier. Some of these dilute colors lilac and chocolate are outcrosses from other breeds brought into the ragdoll some still exist in the older lines of ragdoll also. I know in the ragamuffin breed there are lilacs and chocolates, these lines are from ragdoll lines but have been bred separately into a new breed name now with different lines, some of these lines are mixed with Ragdoll and some now are strictly ragamuffin or ragdolls. I am using some of these lines for my lilacs and chocolates. I think they would be the purest lines to use to get these colors. I am also using two other lines for these colors and am working on my own unique lines putting these together. Minks are from the ragamuffin lines which was in the 1960s from the ragdolls lines. Today they are a separate line that is being brought back into the ragdoll breed for its colors, minks come in all shades, even lilac and chocolate and even flames and tortie. Seals will have a darker body then the regular sealpoint, the seal mink will be almost black, it will have blue/green eyes, blue mink will have a very dark steel gray body and slightly darker points, lilacs will look somewhat blue in the mink color but you will see a dark pink beige color in natural sunlight, if you look closely they are lighter then blue. Chocolate minks will have a pink brown body and slightly darker brown pink points sometimes if you look at the cat in sunlight you will see the pink tint and this helps you to identify the color you really have, minks are not just darker colors, they will look different from the traditional colors almost like a Smokey appearance or a dusty look. The same thing goes for a dark blue or dark seal these are not minks just because they are dark, there must be minks on the pedigree. Some traditional colors are badly colored, too light or too dark but this does not mean you have a lilac or a mink. If the Smokey look is not there then its not mink. if the pink very light coloring is not there then what you have is not a lilac or chocolate. 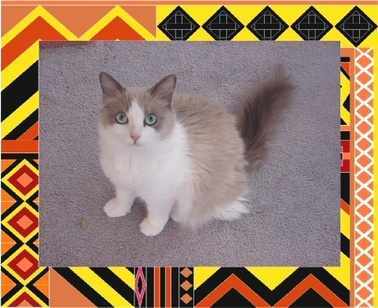 These are from ragamuffin lines which again are very closely related to the ragdoll. these will not have blue eyes but the solid whites will have blue eyes. solid colors come from the mink lines the whites do not. The color sepia is two minks bred together and then bred to another sepia to get solid colors. There is rarely solid lilac and solid chocolates, these are very pretty colors but the eyes will be either green or gold. and very rarely blue eyes have been seen in the sepias but not solids, only the solid whites. The whites are from traditional lines rarely occurring, this is called a white spotting factor, these are still called solid colors but are not from sepia or mink, most breeders do not want this occurring unless they are breeding solid whites. Some of the time a solid white will be deaf in one of both ears but pedigree breeders are making sure that the whites they breed do not carry this defect so this is less occuring when buying a solid white.